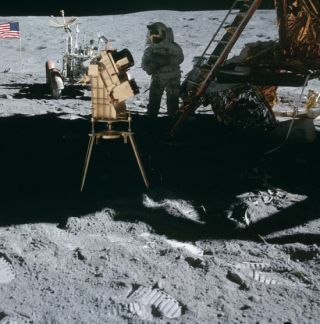 Astronaut Charlie Duke worked near a mini-observatory set up on the moon during 1972's Apollo 16 mission. He landed on the moon nearly half a century ago, but Apollo 16 astronaut Charlie Duke vividly remembers the view while standing on the Descartes highlands. "There was a contrast between the black sky of the moon and the brightness of the lunar surface. It was an incredible contrast," Duke said in an exclusive interview with Space.com. Duke will appear at the San Diego Air & Space Museum today (June 7) at an event to celebrate the 45th anniversary of Apollo 16, which took place in April 1972. Other expected attendees include Walt Cunningham (Apollo 7), Fred Haise (Apollo 13), Al Worden (Apollo 15) and Gerry Griffin (lead flight director for Apollo 12, 15 and 17). To coincide with the anniversary, Duke, 81, has been working with New York-based communications consultancy Chaco to create a new website for public engagement, which will soon be available at CharlieDuke.com. "These anniversaries, as we get closer to the 50th of [the first moon landing] Apollo 11 … help us to recall the adventure of it and the excitement of it," Duke said. "They help motivate the young generation to, as I say, aim high or dream big. I like to participate in these kinds of things, so hopefully, we can change one life to motivate a kid to stimulate them to study in science and engineering." Starting with Apollo 15, the rest of the lunar missions used rovers to do more thorough exploring. These later missions (which included Apollo 15, 16 and 17) also had its astronauts explore the lunar highlands, which had a greater variety of rocks to sample. Duke said one of his most exciting science moments during the flight was finding out that the rocks in the Descartes highlands were not volcanic as scientists had expected. Instead, they were breccias — fragments of multiple lunar impacts by asteroids and other small bodies. "The geologists were excited," he said. Duke also filmed Young doing a "lunar grand prix" on the rover, driving it back and forth at high speed on video so engineers on Earth could see how the rover performed in lunar gravity, which is only one-sixth that of Earth's gravity. Duke left NASA in 1975 with Apollo 16 as his only spaceflight. He still spends much of his time promoting the flight to groups all over the world; his Delta Air Lines miles add up to the equivalent of seven round-trip lunar flights, he said. But Duke also enjoys flounder fishing, investing in technology companies and spending time with his wife, children and nine grandchildren. He also continues to follow new developments arising from Apollo 16. For example, NASA's Lunar Reconnaissance Orbiter (LRO) has imaged both the landing site and the impact site from the mission's Saturn IV-B rocket stage. The rocket stage impact site was unknown for 43 years, until the LRO spotted it. "It's really unique to look back at those [LRO] photographs and see the old landing site of Apollo 16," Duke said. He added that he sees a resurgence of interest in spaceflight these days due to the proliferation of science-fiction films focusing on space. For NASA's ongoing astronaut selection, he added, more than 18,000 people applied for only a handful of spots. The new astronaut class – NASA's 22nd group – will also be announced today. "When I graduated from college, there was no astronaut program," Duke recalled. He was in high school when Sputnik, humanity's first artificial satellite, launched in 1957. The first U.S. astronaut launched in 1961.. But Duke said he had an engaging career in the Air Force before becoming an astronaut, and urged any astronaut hopefuls to first consider their interests before trying for the program. "Pick a career you really like," Duke said, "and even if you never get selected for an astronaut, you will have … a lifelong career that will be stimulating and exciting."